Look Sharp, Sconnie - Midwestern Fashion Nerd, Chronic Over-thinker: WWWW? Alas. It seems that I am powerless against Waldo-inspired attire [what would Waldo wear?]. Paired with florals here, might I add. An interesting and impromptu combination that I'm admittedly willing to try again - and with intention this time. What if I wasn't joking. 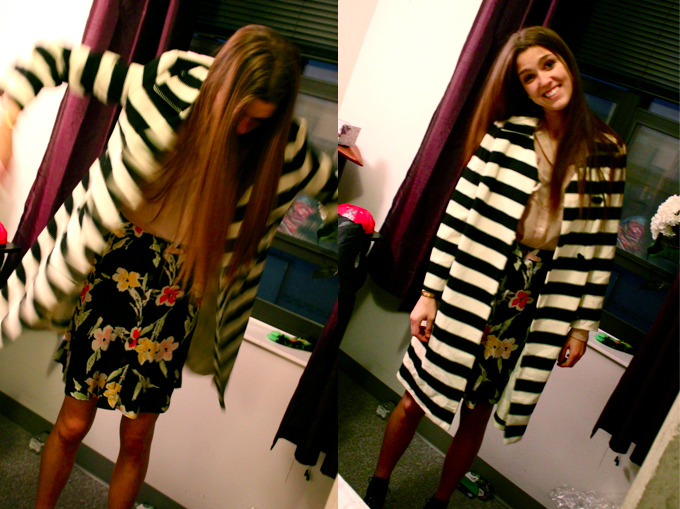 love, love, love the striped jacket!! and thrift stores are so dangerous... i know i can never go in and not get anything! thank you so much for your sweet comment on my blog :) congrats on graduation!! paris is super sunny right now so it's definitely time for dresses. just got to berlin. wee! Thanks for the link! No question there - they certainly do convey similar sentiments. I think this one's a little more retro than the Burberry, and also about $2,990 less expensive. But nothing in this world is as cool as the collar on that coat. A crocheted collar!!!? With that gold? Insane. Love the coat! Definitely a Waldo-inspired piece, if I owned that I'd probably hide behind the couch or under the table and not come out until someone found me. Or is that just weird..? Thanks again for your lovely comment! 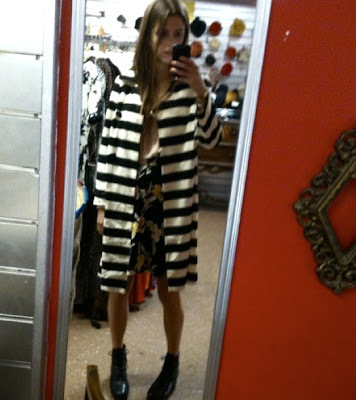 I love this jacket, I'm obsessed with black and white stripes at the moment. Love the skirt you're wearing as well. I'm exactly the same- I always intend just to browse but never have any willpower to stop myself from buying stuff. Now following on blog lovin because the follow bar has disappeared!